Must be Active Duty Army or Air Force, with a minimum of 4 years (Army) or 2 years (Air Force) active commissioned service as a Physician Assistant. The US Army/ Air Force-Baylor Emergency Medicine Physician Assistant (EMPA) Residency is an 18 month program that incorporates a variety of clinical rotations, formal didactic instruction, and research. The residency prepares the EMPA to evaluate, diagnose, and stabilize those conditions which pose an immediate threat to life and limb. The US Army/ Air Force EMPA Residency is unique in that it exists within an established Emergency Medicine Residency (San Antonio Uniformed Services Health Education Consortium/SAUSHEC) which enhances educational and research opportunities. In 2007, in collaboration with the sponsoring institution, Baylor University, the EMPA Residency was approved as the first Doctorate of Science (DSc) degree producing program specifically for PA’s. In 2011, the US Army-Baylor residency expanded to partner with the United States Air Force (USAF) to form a joint training in order to provide additional emergency medicine physician assistants to support global missions and beneficiaries. To provide a formal educational environment to facilitate development of emergency medicine physician assistants and clinical scientists to better serve Military Health System beneficiaries. To practice evidence-based medicine and conduct clinical research to benefit MHS beneficiaries, the U.S. Army and Air Force Medical Departments, and the physician assistant profession. Be the premier post professional physician assistant residency program in the country, establishing the standard for clinical education by the pursuit of clinical excellence through professional development and scientific inquiry. A 6-semester, 24-month professional program that leads to a Bachelor of Science degree in Health Sciences and a Master of Science degree in Physician Assistant Studies and qualifies graduates to take the NCCPA exam. The program is offered at both the Bay Shore campus and the Winthrop Hospital Extension Center. 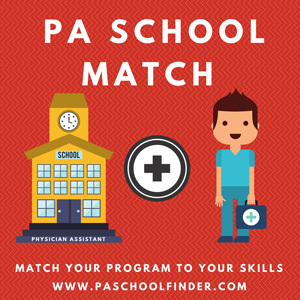 The two are equivalent programs whose curriculum is designed to educate students to function as Physician Assistants delivering high quality health care to all patient populations. The program provides a nurturing learning environment, and stresses the importance of continuing medical education. The mission of the Physician Assistant Program is to educate and prepare competent, compassionate, and committed Physician Assistant leaders who, as integral members of the modern professional healthcare team, are driven by academic excellence and will be servant leaders in their communities. The faculty and staff of the Physician Assistant Program will provide academic and clinical excellence in an environment of compassion and team cooperation, seeking to prepare clinicians for a lifelong commitment to continuing education, leadership, and medical service. The mission of the College of Saint Mary Physician Assistant Program is to establish an educational environment fostering academic excellence and leadership, which prepares students to become competent Physician Assistants who possess the knowledge, compassion and clinical skills necessary to provide high quality medical care to all patient populations, including those that are underserved. The Neonatal Physician Assistant Residency Program at The Children’s Hospital of Philadelphia is a 12-month intensive program designed for physician assistants (PAs) seeking to subspecialize in neonatology. The Springfield College Physician Assistant (PA) program educates primary care physician assistants eligible for employment in a wide variety of medical settings and specialties. This is a 27-month graduate program which awards a master of science in physician assistant studies. There are two different entry points to the program. The mission of the University of Medicine and Dentistry of New Jersey Physician Assistant Program is to prepare primary care physician assistants who will provide health care under the supervision of a physician in a variety of settings in order to meet the needs of the community. The mission of the Stephens College Physician Assistant Program is to educate and prepare clinically astute, compassionate, and patient-centered physician assistants who will become leaders in their profession, while remaining dedicated to meeting the needs of the medically underserved. Graduates will be ethical professionals, committed members of the healthcare team, practitioners of evidence-based medicine, and providers of quality healthcare for those they serve.